This case study was modified from the National Center for Case Study Teaching in Science so that it is more appropriate for basic high school students in anatomy and physiology. This case is intended to be used during the chapter on muscles as it requires students to examine how the neurotransmitter, acetylcholine is used to trigger and muscle contraction. In this case, the subject is eventually diagnosed with myasthenia gravis. Students must define basic vocabulary words that may be unfamiliar to them and label a diagram of the neuromuscular junction. They are also introduced to the concept of autoimmune diseases which will be a common theme throughout the basic anatomy course. 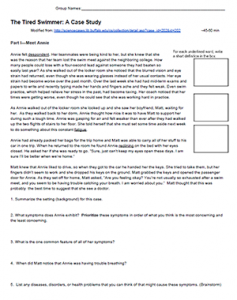 The activity encourages students to use resources, like their textbook and google to help them solve the case and propose treatments for the patient.